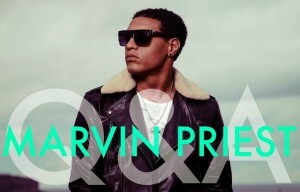 Marvin Priest burst onto the Australian charts back in 2011 with his breakout hit ‘Own This Club’. It was an undeniable smash hit, notching up a double platinum accreditation and earning the singer an APRA Award for the Urban Work Of The Year. A few singles later and then it was all quiet on the home front. The son of reggae superstar Maxi Priest, Marvin has just released his first new music in two years via the new single ‘Higher’, so we decided to pop a few questions in his direction to get all the guff. Q : You seemed to come out of nowhere with your debut single ‘Own This Club’. Was that always your evil plan… to take over the Aussie charts by stealth? A : Haha! No evil plan, I just wanted to be heard… It was stealth, but one or two people had heard of me as I had already been touring for three years around the world with my dad. It was while we toured Australia that I got the fortunate opportunity to meet good people who enjoyed my music and it basically started from there. Q : And it was a smash hit. We’re presuming it exceeded your expectations…? A : It most definitely exceeded expectations and was an amazing achievement, but it felt deserved as we had worked hard leading up to that point. Q : Was there a reason you chose Australia as the launch market for your solo music? A : For a few reasons… At the time the charts and the people were into the same music as me, so it was a perfect match. I was new and different and it made a good fit. I had also moved to Sydney after a few visits as I loved it, so it all made sense. Q : You dropped your debut album ‘Beats & Blips’, but then seemed to drop off the radar. What have you been up to this past few years? A : I did drop ‘Are You Ready’ in 2012 but felt like I wanted to change my sound. So in 2013 I was in Melbourne, Sydney, London, L.A. and New York working with different producers on new material just to freshen up my whole look and vibe. I felt like the charts had started to get saturated with artists using the same formula, sounds and producers and I wanted something else, which I felt we found. Q : Tell us a little about this new track of yours ‘Higher’, who you wrote it with and how it came about. A : I worked on this track with a DJ called G Wizard and Xavier, a producer from Canberra. I’ve known G Wiz for a few years, he played me this idea they had and I loved it. The basic concept and idea was there already so I took it home, wrote my verses and recorded it the next day. We heard it back and it just felt right. Q : It’s still in the dance/pop realm, obviously, but it feels a little more organic? A : We didn’t want to stray too far from the realm, but we wanted to show another side of me. It lets me sing a little bit more and it’s not a typical club song sonically or lyrically, which differs from my previous releases. Q : What can we expect from the video clip? A : It’s gonna be amazing and I can’t wait for everyone to see it. We haven’t finished filming and I don’t want to give too much away, but it’s nothing I’ve done before. People will get to see me in a different light and as more than just the crazy party guy. Q : So what’s to come after this? Have you been beavering away on a new album? A : Yes, most definitely. I’ve got some really fresh material that I’m proud of. Hopefully everyone will love and appreciate my musical journey and will see the growth and transition. Q : And when might we expect to see that? Marvin Priest’s new single ‘Higher’ is available digitally now.